Black August is a phenomenon, it's not a gimmick. It's my heart spilled out on paper. 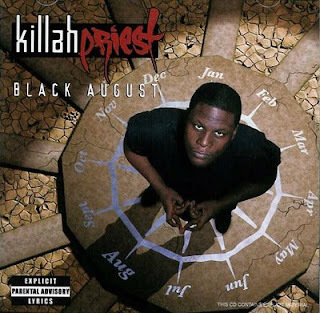 When it comes to lyrics, few can express the trials and tribulations of the daily grind like Killah Priest can. On the innovative stylings of "When I'm Writing", Killah breaks down his personal form of psychotherapy into a series of mentally charged metaphors, "I write rhymes like I'm doing time/Listen, when I hit the pen I start doing a sentence/ I got the flow locked behind each bar." Later on the conceptually driven "Deja Vu", Priest flips a dramatic storyline of a criminal trapped in a horrific turn of events. And "Robbery" perfectly exemplifies Priest's metaphoric vision as he uses an everyday heist to represent his aim to claim what is rightfully his. Pushing past what's expected of him, "Rain" finds Priest on the come-up, spitting with a Midwestern influenced bounce track alongside Main Flow. With an arsenal of solid tracks and candid lyrics, Killah Priest is in the best shape of his life. With his freshly inked deal with Recon/Artemis, Priest is determined to make serious moves. "It's about time I had the right promotion behind me. A real team of individuals, that's what this album is all about," declares Priest. "That's why I called it Black August. It's gonna be a terror to some, but to others, it'll be a nice day." With his steadfast devotion to enhancing hip-hop culture, Killah Priest is poised to break some new ground and give the game exactly what it's missing.